I’m lifting these comments by Doug Marker on my last entry to a seperate post since I think they are very well worth reading. Thank you Doug!! The only thought I’d like to add is about the world war 3 hypothesis, at least involving the US (without them I wouldn’t call it WWIII). 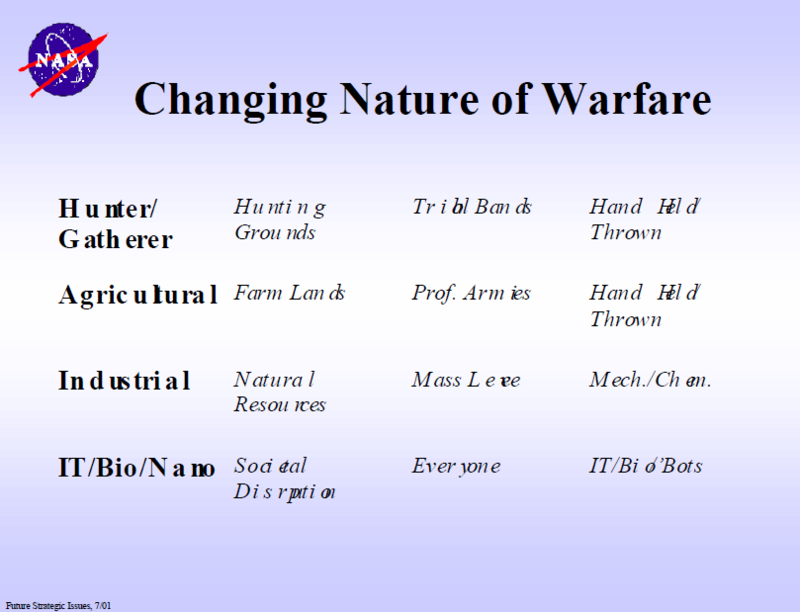 With energy assets loosing value, there is actually less to make physical war about; less gain = less war. This is an essay that considers the possibility and likely consequences of a disruptive new energy technology emerging very quickly. least 3 but optimistically up to 6. The announcement that it reached 50 for such a long period of the test was stunning to say the least. A COP of 50 is not a simple advance, it would be spectacular and if accepted today, an energy game-changer and a perfect example of a ‘disruptive’ technology. One that has the potential in a very short period to shift the way energy is created and used. Changes that would alter the fate of many countries, especially those who have built their economies on selling oil that is on average dearer that cheap Arab oil but still profitable for them. Some countries (esp in Sth America & Africa & some parts of the Middle East, plus those European countries who rely on their more expensive off-shore oil. Some could face political collapse if their oil loses its strategic role and value. Oil is an intrinsic part of most nations foreign policies. Saudi Arabia is a special case and is of concern for a number of special reasons. It is a fragile country in this regard. Fragile in the sense that a shift away from oil as a primary could see the Saud family dynasty overthrown and Sunni Wahhabi extremists take over. This is what they are already attempting to do in Syria and Iraq. It is interesting that just in this past month the US Govt has directly intervened in the affairs of Saudi Arabia who have now committed to: one, divesting themselves of 100% control of their nation’s oil reserves (still the largest in the world); and two, to open the country up. The current closed to outsiders approach has to end. Dropping their isolation is the best way to undermine the Wahhabi extremists who are taking full advantage of the closed nature of Saudi Arabia society because of the isolation enforced in the past by the Saud family. Any deeper turmoil in the Middle East could be a harbinger of world war 3. The tensions are ripe. 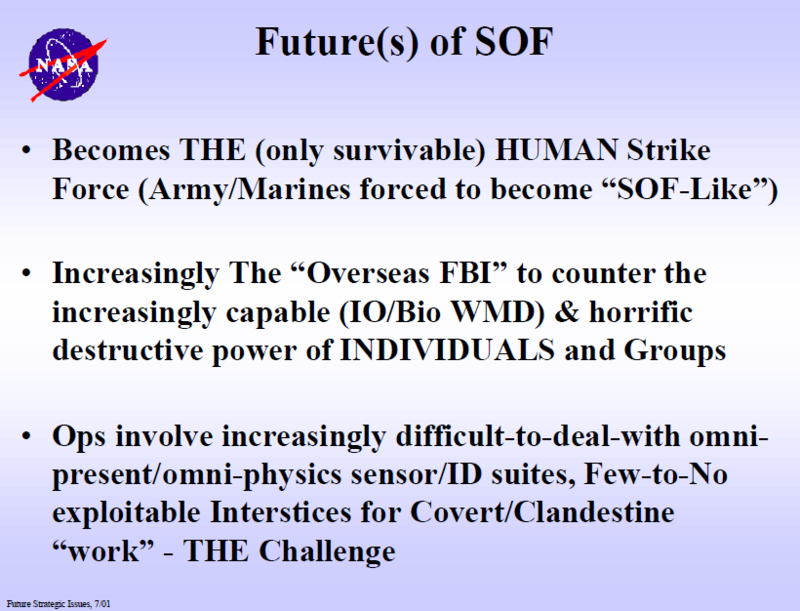 One fuse could well be a disruptive technology emerging that kicks the feet from under oil as a primary strategic commodity ruled *and managed* by nations’ and intrinsic in their foreign policies. Anyone in any doubt only needs to read Daniel Yergin’s Pulitzer prize winning book “The Prize”. The story is an amazing one. If, as I personally suspect, the attacks on LENR and even Rossi, are all about delay, the need being to get the world in order first. If this were to be the case, then the current contradictions, the claims and counter-claims, seem to fall into place. The bigger picture has national interests and conflict avoidance at heart. The small picture is to get LENR on the table as a working ‘new energy’ we can all make use of. Climate issues are a seperate matter also needing consideration. I expect the current debate to continue at a shrill level. What I watch out for are the people who have a clear history of whipping up anti LENR and anti Rossi hysteria. That choice of word is IMHO a perfect fit for much of what is being said about Andrea Rossi. The way he is spoken about by supposedly well educated intelligent people is simply irrational unless the nature of the personal attacks is to serve a purpose or is part of a hidden agenda. The evidence seems to be to delay LENR emergence at all costs and Rossi the man is one cost. Also, consider how many of the better known anti-Rossi attackers, are so certain they know 100% what they claim is true, that this somehow allows them to be so virulent in their claims, when, none of them thus far have been directly involved. Does anyone remember the hysteria that occurred in the USA in web forums over the US decision to invade Iraq. I remember it only too well and how nasty and shrill the pro-invasion ‘voices’ got. Those of us outside the US had a very different view of if Saddam Hussien had the weapons of mass destruction that the administration claimed and used as the justification for the invasion. Then years later we learned (via leaked documents) that some US Govt agencies and military interests set up teams to go into forums and chat sites to force their views anywhere that serious questions were being raised against the invasion. I had not experienced anything that nasty before until now, but acknowledge the ‘Pons & Flichman episode also got very nasty. So today the virulence is about anti LENR remarks and in particular some rather vicious personal attacks on Rossi and now even other open minded blog journalits like Peter Gluck, Jed Rothwell and Matts Lewan. These are people who seek to keep an open debate and avoid extreme positions that are showin g up in the anti side of the debate. No one should argue that nations are not aware of the limited life span remaining for oil as a primary source of energy. Governments worldwide have met and chosen to work together to devise alternative non-polluting sources for a replacement primary energy. The belief is the world has 30-40 years of known oil reserves and new ones are still being located. The Tokamak as our saviour. Tokamaks (from Wikipedia) “is a device that uses a powerful magnetic field to confine plasma in the shape of a torus. Achieving a stable plasma equilibrium requires magnetic field lines that move around the torus in a helical shape.”There are several Tokamak projects underway in several countries. Notably ‘ITER’ in France a combined effort between China, Europe, India, Japan, Korea, Russia and the USA. 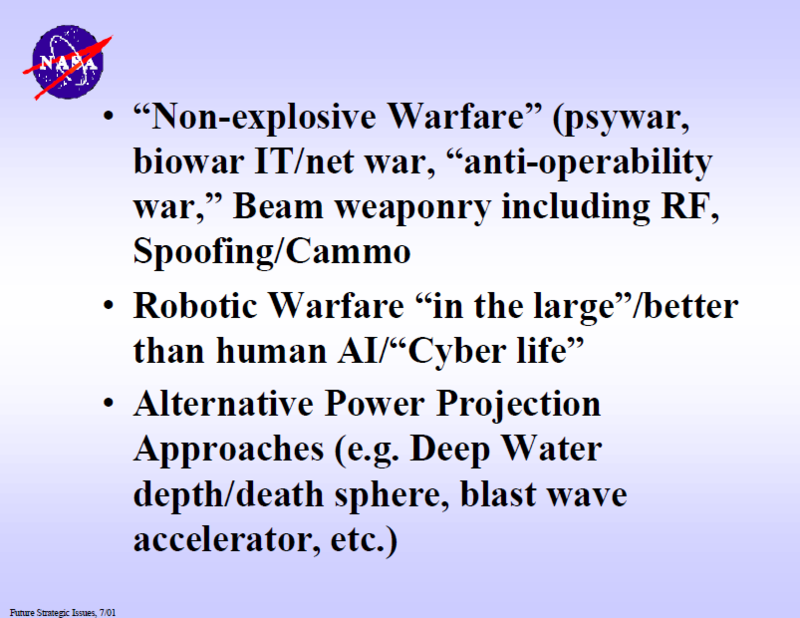 Then there is an even longer term follow-on ‘DEMO’, plus China also has its seperate ‘CFETR’ project. But the Tokamaks seem to be still decades away even *if* they can be made both effective *and* efficient. The point that needs to be made here is that Tokamaks are massively expensive and massively complex and as of today massively under-performing. The goal is for 500MW out for about 50MW needed to drive one. A rough COP of 10. Perhaps in 20 years if we are lucky. Wind power is a help but is not a large scale solution, it is expensive to set up, expensive to run and maintain and requires constant subsidization. Denmark is a world leader in manufacturing windmills and as well as exporting them uses them to supply a significat percentage of their national needs. But, they are highly subsidised. Denmark also has a particularly large area of shallow ocean surronding its landmass and a good average of wind to run the windmills. Solar panels are also not yet a satisfactory solution and have similar cost to manufacture, logistics and maintenance problems as wind power devices. LENR as a solution is in a class of its own once it is finally accepted, the devices refined and the biased bickering about the lack of a theory is put into perspective. If however Rossi has his ‘miracle’ eCat, or there is perhaps some other known LENR such as Brillouin’s boiler, or even some under the radar LENR project, that have working potentially disruptive new energy technology. Then there are the other claims such as that of Randall Mills and his brilliant light technology, then disruption may well be nigh. A ‘potential disruption’ line of logic can not be easily dismissed or sneezed at. The energy claims *are* out there, the consequences of any of these claims being real and perhaps ready to be developed are monumental. Those who choose to rail against LENR based on their conviction that the science hasn’t come up with the theory, need to read about the history of science and the blatant opposition to new theories that has dogged science since it began. So many discredited ‘theories’ later allowed science to leap ahead in the way it has. LENR *has* already been proven to be real. The propagandists refuse to admit it. So, those who argue otherwise have a problem or an agenda. The LENR issue is “is it ready for prime time”. Back to the Middle East, we have seen the consequences of national aspirations of Middle East people rising to the surface. The map of the Middle East is crumbling and the artificial boundaries set as a consequence of the WW1 and WW2 western carve ups (read Daniel Yergin’s book about this) are no longer useful nor defensible. The same might be said of African nations too. Many of these were western political carve ups that cut across traditional tribal boundaries and loyalties. One recent regional upheaval has been the Iranian revolution. The Shites of Iran saw a potential to create a grand Shite Caliphate encompassing Iran (dominantly Shite), Iraq (dominantly Shite), Syria (where Shites are a minority but rule the country as the Alahwite sect of Shia, Lebanon (where Shite Hizbollah militias have effective control) and Gaza another Hizbollah stronghold. Had Iran obtained a nuclear weapon capability, that along with Irainian expansion (as was happening post the Iran-Iraq war) then the potential for a Middle East conflagration was well brewed. However, the western powers have managed to contain Iran, and despite the misgivings of some western allies (read Israel) the US has recently pushed to end Iran’s isolation and has promoted the acceptance of its status as a potential regional superpower. A reality that horrifies the Sunnis led by the Saudi Arabia. In retaliation for Iran’s ambitions, groups of Iraqi Sunnis combined with Syrians, began fighting for their own Sunni Caliphate. It would take part of Iraq, part of Syria, all Jordan and if they could, all Saudi Arabia. ISIS/ISIL are the core of that movement. It is a continuation of the dreams promoted by the Saudi Osama Bin Laden and an extension of the Wahhabi movement that is so strong in religiously controlled Saudi Arabia. These Sunni extremists have shown they are a force to be reckoned with. IN Syria and Iraq, they are using captured oil to fund much of their revolution. The fear from the anti-Iranian powers is that with the US-Iran peace, based on a commitment of Iran not to develop a bomb, now signed, that the Iranians are free to expand trade and export oil without constraint which could allow them to become so wealthy that no one could stop them doing whatever they want including secret work to proceed on their nuclear weapons program. The balance between moderates and hard liners in Iran is on a knife’s edge. So a what-if scenario is that ‘what-if’ the western powers (America in particular) know that there is a replacement for oil, ready and capable. Then establishing peace with Iran means that Iran will have very limited time to take advantage of its oil. The prices could (and would) drop to a small profit more in norm with any other useful (but not political) commodity. Iran’s ambitions would and could be held in check, i.e. Iran could not use its oil muscle to threaten neighbors or anyone else. It seems to me this is a valid scenario that has been stitched up and being enacted now. Getting Saudi Arabia under control seems to be the current item on the agenda and the goal seems to be to starve the Wahhabi extremists of an opportunity to overthrow the Saudi government and then have in their hands the power that oil would give them. The Saud family are on thin ice. They are an anachronism in this modern age. They have been getting away with it because they controll the world’s greatest oil reserves and also one of the cheapest in cost per barrel to lift. I don’t know what today’s real cost per barrel to lift are (it is all online though) but there is a big difference. The cheapest was always the Iraq oil, Saudi oil came close, but then the cost starts to rise markedly. Off-shore oil is much dearer per barrel to lift, Alaskan oil even more so. Many of the smaller oil nations such as Venezuela and Nigeria have of late only kept their production costs around sale price. Any significant drop in price would hit them hard. So again, the case exists that a sudden introduction of a disruptive new cheap energy could topple many producing nations. The political instability would affect us all. At worst trigger a new world war. So, if LENR has been proven, then the governments of the world have some very serious challenges they must deal with before any shift in the balance of energy power shakes up the world. What is the use of owning a cheap eCat if we are all off fighting world war 3. Here too are some opinions claiming the imminent collapse (I hope that has been staved off) – but, such opinions raise the specter of a cash rich country collapsing. ANALYSIS: The House Of Saud: Is It About To Burn Or Just Collapse? An interesting commentary of the re-emergence of Iran. Here is a very important link to cost of oil production versus current price. Look at the chart titled “Breakeven oil price by country”. It is clearly a problem for most oil producers and getting worse if the price of oil keeps dropping – currently listed at that site as $37 a barrel. Again, if someone has a disruptive energy technology close to being usable (even if still a few years away) then the picture gets very bleak for some of those nations. The impact of this technology will be very disruptive to political systems, no doubt. But the impact may be environmental as well. While we would be eliminating the burning of huge quantities of fossil fuels, we would also be unleashing huge amounts of “free energy” (from nuclear sources) which is still energy that needs to be removed to maintain an equilibrium. Except with free energy, there will be little emphasis on utilizing energy efficiently, adding even more useless energy (as waste heat) to the environment. And with free energy, development would rapidly spread into rural areas and other undisturbed natural areas. While energy would no longer be a limitation, land will be, and unless we find a way to make unlimited free land, there will still be wars and conflicts, maybe even more so than there are today. I make no pretense to be a treehugger or environmentalist, but with free energy, there is virtually no limit to the spread of land development. Very interesting, I agree; I remember a phrase in Human colonies in space (GK O’Neill) telling about of heat barrier limit inherent to a continuously growing civilization; he wrote about the unsuperable limit to energy usage on Earth, so proposing to transfer the most industrially intensive activities in space. 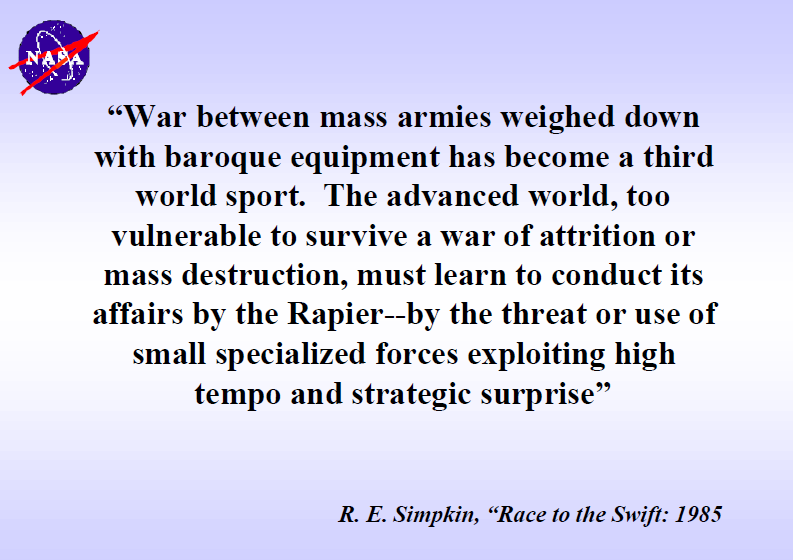 On wars (@ Sifferkoll), I doubt that diminishing gains could withhold imperial blocks to fight, if you look at the deflationary crisis til the beginnng of last century, with lack of further markets and capitallistically exploitable territories, and contemporary raising of new economic powers, only solution for capitalism was destroy and rebuild from scratch. About wars: I agree that they keep fighting, but it’ll be more like a “third world sport” as the NASA slides call it. For the real power players, controlling the taxpayer and the transactions between them is much more important (including terrorists etc). NASA covers this quite well in the slides. This is what I mean by the WWIII already going on. Yes but take into account that “thirld word” is not a definition given once for all. If you read Lenin, or Paul Kennedy, or Kissinger, you’ll find that powers fall and rise relatively quickly; think at China; if Europe, or US, fail in winning THEIR wars, cannot expect to stay atop any longer, given the rate of geo-economic change. And US were doing a war for every generation of americans, after WWII. These were small scale wars because the crisis were localized. US were forced to set up these conflicts, to stir up factions ones against the others, in brief to stay at the center of the stage to mess up the situation, divide and conquer. Above all, the main target was to contain the rise of China. If Europe too fails to build and exercise its own imperialism, we will tumble to a third world rank for sure. You can see Japan, Germany, etc (very quiet nations, after WWII) now struggling to jump inside the live action on battle fields, they know there is something big at stake. So stay tuned, because situation will evolve in absolutely incredible and surprising way, I can assure you of this! I’m too a big Armstrong fan, he understand well Marx and Lenin, even he cannot agree of course. Kissinger too is a big scholar. LENR is NOT free in any sense of the word. That it might cost 10% of what coal-generated heat and electricity costs is not insignificant. It would destabilize everyone mentioned in the article (and quite possibly the entire global political system)- but the primary beneficiaries of very cheap but difficult to produce (at least for the foreseeable future, even if Rossi markets a product this year) energy sources will be the large corporations involved in this new industry, and any with enough foresight to buy early. Your point about the incipient land grab is impeccable, but waste heat is not- the terawatts the world currently consumes wouldn’t register any measurable average effect on global temperature. Whatever human impact there is on climate, it’s overwhelmingly due to GHG- and we DEFINITELY know it’s acidifying the oceans, regardless whether one chooses to accept any effect on global average temperature. The ocean pH is alkaline. There is no acid ocean. The floor of the oceans is covered in megatons of manganese nodules and carbonate rock forming a an impenetrable pH buffer. There is no ocean acidification, and cannot be. For instance about ABB business, which part of business isin energy systems and products, More than 50% ? What is the amortization period of Energy infrastructure. It is not only about Energy. 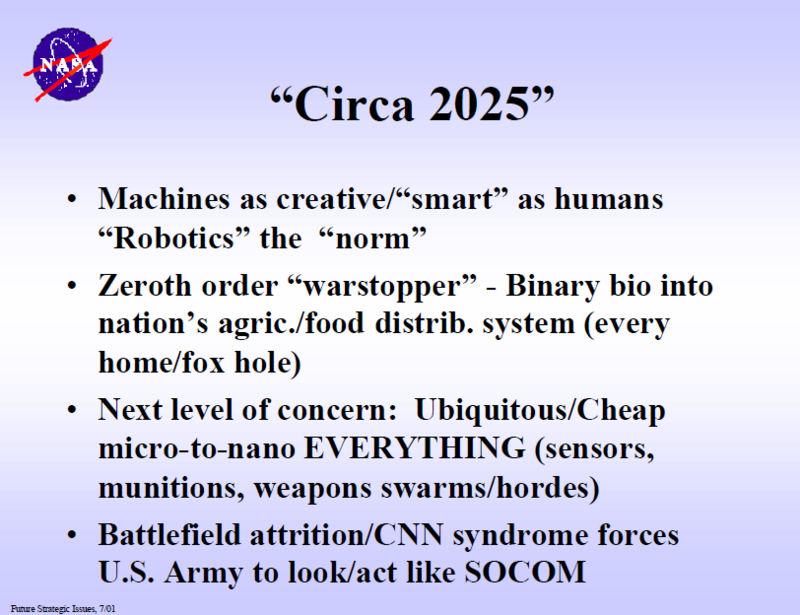 I could add that going into space, together with a LENR revolution and artificial intelligence breakthrough, is IMO the only way to try perpetuate indefinitely the necessary capitalistic expansion, instead of a communist revolution to an upper stage of civilization without markets, wage work and money. And I think this is the underline of Musk’s or Bezos’ vision, but I guess that they will absolutely fail in the project to transfer hundreds millions human workers (because this is the necessary size) off the planet: first big space disaster, coupled with mandatory short-span investment return cycle, will surely put on the brakes. Above all, they will not succeed before the necessity of mutual destruction already looming at the horizon. Many centres for strategic studies claims that WWIII (World War 3) is already here, but we do not recognise it as it is completely different from WWI and WWII. Today you direct migrant and refuge waves to trample you enemy. 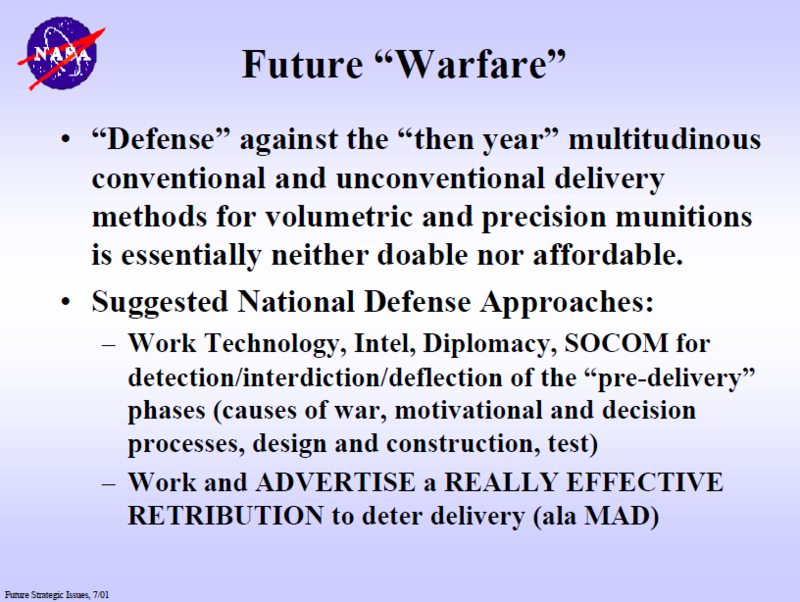 More or less like a old fashion cavalry chock… Hybrid warfare. This will cause unrest. Social problems and collapse of medical care and have the same results as the “Blitz” had during WWII. Social media can be used to create flash-mobs like in Germany 2016. It is happening right now here in Sweden. Migrant politics is on spot 1,2 and 3 in every media every day (different angles though on MSM and alternative). I do follow this a bit by analysing twitter sentiment. Interesting stuff. I actually see LENR (ie. really cheap energy) as more or less the only possible savior here. It will more than anything help to fill the basic needs (Maslow level 1 needs) for every people on the planet. Politics the way we perceive it historically is dead, since the new important political resource is CONTROL (opinion/information/transactions/etc). War is not defending against other gov. entities, but defending against individuals. NASA points this out clearly. Only a note on this, it looks to me a definition that suits well exactly the purpose of a state to exercise that control on people you referred. Like, I am the State and I tell you, little serf, to gimme your vote that I will fight those ugly terrorists. In reality, terrorism can be the only weapon available to relatively poor bourgeoise of would-be new imperialists, like arab countries. Europe nations, at the early stages of bourgeoisie seize of power, used terrorism to fight the kings. Or it can be an undercover way to make war acts without popular support, like US in central america last century. Terrorism is purely a capitalistic invention. After a bourgeoisie exits this emergency phase, the capitalisic bourgeoisie exerts its power with best possible organized and efficient way, the armies. If LENR is indeed neigh, disruption in the energy field is a logical consequence. It would also starve the present oil rich unstable territories of income and would no doubt destabilize the area. Because they lack money the expansion to a WW3 may not happen. I foresee another consequence that could destabilize the world in time: Infinite energy would minimize traveling cost and I believe that we would travel more and more through the air in small drone like vehicles. That will make territories open and it will become extremely difficult to avoid that people of poor countries go to rich areas. That will lead to extreme measures and instability everywhere. (See what is happening now in Europe). Defending your territory (and wealth) has always been the primary reason for war. One thinks about LENR and Energy but forgets or underestimates the most important with LENR: Decentralization. Back to the basics. Innovation is a social process which means actors in a position to reshape the economy/society must find mutual self-interest to change their own position, that is to say each of them getting more value at the end, and each of them with compelling reasons to act. Invention is the catalyst or materialization of the corresponding forces. Zero sum game works when losers can find an alternative. When an invention has a pervasive impact, any non-global approach, not aligned with this process generates forces to inhibit unbalanced self-interests and need more time to find some equilibrium… There’s no alternative for the losers and anything can happen. So it might be 10 years  or quicker with a huge destruction of value whole results are unpredictable as the process of Innovation is itself dynamic (like LENR). Then, no way? … One knows at least one solution. Implementing a global Approach looks like a domain of coherency in Physics. Let’s first consider what we know with the World Wide Web. How to use the core technology is simple and its intrinsic value is low, the technology is open but what makes the difference is its inherent attributes of adoption which create mutual self-interests (the network), compelling reason to act (the user) and easier integration. The value anyone can get by joining is higher than with any competitive strategy for all actors including leading corporations in Information technologies. How to add missing attributes and why? The reason is obvious. Implement a global and fully shared adoption process means less risks, more “value density’, more investments so, less time to be mature and so on. If everything changes at the same time with dependent variables at each level, there is less changes but everything is different. Then, How to add the missing attributes? The answer is well known. Finding the right business model and the generic pattern of this model is known. The platform model. The paradox is the following: One needs to develop the technology but not to sell the technology itself. The value proposal is to enable adopters to get value with it. LENR must not be considered as a standalone topic. There’re obvious interdependencies with many ongoing innovation processes such as the electric car, green economy, nanoscience revolution and so on. Obviously, there’s the scientific challenge. LENR is Transdisciplinary which means innovation process also applies to the scientific challenge. I think you can guess what LENRG team is working on since 3 years in order to contribute to the global effort. If we can produce cheap and clean energy will not be hesitate to be introduced. The Third World War is a much smaller threat than global warming. The E-Cat will turn arctic regions into farms with completely controlled growing conditions, unlimited water, and no unwanted insects or diseases. We currently have 7 billion people on earth because we can feed 7 billion people. How many people will we have when we have the capacity to feed 20 billion people? With unlimited energy, how many areas now considered uninhabitable will become habitable? There are 118 oil producing nations. Only 15 are net oil exporters. Only these 15 nations will see an economic downturn with LENR. The monies saved with cold fusion are staggering. Transition expenses are recovered quickly. Tons of monies will be freed up and redirected. Can they be redirected to benefit all? To be in the top 10 you need to be producing close to, or well over, 3 million barrels a day. Taiwan is not considered an official country by many, which would bring the count down to 195 countries. Although Taiwan operates as an independent country, many countries (including the U.S.) do not officially recognize it as one. According to the International Energy Agency (IEA), in 2012 over 64% of world oil production came from the top (producing) ten countries: Russia 544 Mt (13%), Saudi Arabia 520 Mt (13%), United States 387 Mt (9%), China 206 Mt (5%), Iran 186 Mt (4%), Canada 182 Mt (4%), United Arab Emirates 163 Mt (4%), Venezuela 162 Mt (4%), Kuwait 152 Mt (4%) and Iraq 148 Mt (4%). Total oil production was 4,142 Mt, up 3% from 4,011 Mt the previous year. Now the top producer is the U.S. followed by Saudi Arabia and Russia. The Lugano fuel disclosure has allowed replication to progress. That’s the last thing the top oil producing wanted to happen, yet it is. All future oil plays are on hold. Exploration is at a near standstill. Lenders will not consider under $60 or $70 barrel price to recover investor dollars. The brakes are on. The U.S. is not a net oil exporter because we use so much energy per capita. Oil is the world’s number 1 export product. Amounting to 4.8% of the global value of all export products, crude oil shipments totaled US$786.3 billion for 2015. That figure represents a -50.3% drop in value since 2011 and a -44.4% decline from 2014 to 2015. Middle Eastern countries accounted for the highest dollar value worth of crude oil exports during 2015 with shipments valued at $325 billion or 41.3% of global crude oil exports. This compares with 18% for Europe, 9.9% for North America and 7.7% for Latin America (excluding Mexico) and Caribbean exporters. All of the above international traders posted declines in the value of their crude oil exports from 2011 to 2015, ranging from -27.7% for Canada to -75.7% for Iran. Besides Iran, other fast-declining oil exporters were: Mexico (down -62%), Nigeria (down -57.8%), Norway (down -56.7%) and Venezuela (down -54.4%). The listed 15 countries accounted for 80.5% of all crude oil exports in 2015 (by value). Excellent material – very sobering. It is very helpful to see the details laid out. In regards to disruptive LENR and world economics. Which countries are reliant on oil imports? These countries will no longer need to fight for, pay for, or worry about economic vulnerability caused by oil dependence. Great for their economies. Definition: This entry is the total oil imported in barrels per day (bbl/day), including both crude oil and oil products. Several Europe countries have taxed CO2. With LENR there is no CO2 how are they gonna balance their budgets? Tax LENR similar to how gasoline is taxed. If one buys a 10KW unit from Leonardo Corp. for $600 then tax 2 gasoline rate in Canada would be 30-50% or $180-$300 and for each 6 month recharge unit @$20 this comes to $6-$10 or $12-$20 per year.. Still cheaper than grid power whether electric or gas. And less than solar or wind upfront costs.Ongoing maintenance costs are anybodies quess. For wind and solar these are knownand can be handled by most reasonable. LENR may develop radiation costs at startup times. What that entails may have to wait for a full theory on the way it works. When Hot Fusion started to be developed no residual radiation was expected. Now it has is known to have some materials, and increasing that will have residual radiation. So with LENR. From none to some Gamma and some neutrons depending on the particular mix of materials and method involved. Very low to almost non-existent. For home use certification requires almost none. Further taxes may be based on this problem.